Used, kettle powers up and boils water . This Kettle has been tested and descaled and cleaned. KLF03SSUK-Polished Steel. In Polished/Stainless Steel. Used, kettle powers up and boils water . The letter are 3D on the new KLF03 Models. This kettle has been de-scaled. Used, kettle powers up and boils water, may contain minor scratches and marks. Small Dent on lid or body. This kettle has paint missing from the inside of the rim. It does not affect the performance of the kettle, and is not visible while the lid is closed. This kettle has a small dent/scratch on. This kettle has been descaled, tested and cleaned prior to dispatch. This kettle has a small dent or scratch on. This kettle has been descaled, tested and cleaned prior to dispatch. This kettle has been de-scaled. 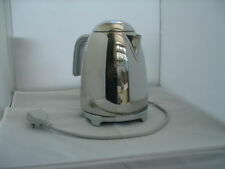 Kettle powers up and boils water, May contain scratches and marks and other minor defects. Condition is Used. pet free and smoke free. fully working and looks great. 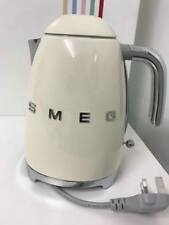 SMEG KLF11PGUK 1.7L Jug Kettle - Pastel Green Excellent working condition cleaned & descaled. Faint marks as shown although condition is very good to excellent. This kettle has been de-scaled. kettle powers up and boils water. 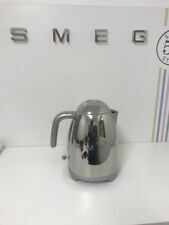 SMEG KLF11SSUK Chrome 50's Retro 1.7L Kettle Excellent working condition cleaned & descaled. Some wear as shown although condition is very good. Condition is Used. Quality Italian design with a retro look gives you a kettle that works effectively whilst also adding aesthetic charm to your kitchen counter. Keeping your kitchen safe is important. Used, kettle powers up and boils water . This Kettle has been tested and descaled and cleaned. 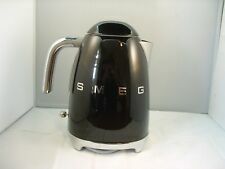 SMEG KLF03BLUK 50's Retro Style 1.7L Kettle - Black 3D Letters Excellent working condition cleaned & descaled. Slight wear as shown although condition is very good to excellent. There are no dents on this kettle and all the letters are in place. see photo. The push lid does work but can be quite stiff so I used to fill the kettle through the spout. 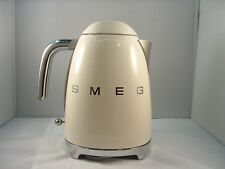 SMEG Klf 11 Pbuk Blue 50's Retro Kettle. Condition is New. Dispatched with Royal Mail 2nd Class. Stylish 50's style kettle beautifully crafted with a stainless steel body. Frequency: 50/60 Hz. Anti-slip feet. Auto shut-off at 100°C. 360° swivel base. It has non-slip feet so is always stable and safe to use. The 360 degree swivel base makes this kettle safe and comfortable for everyone to pour their cuppa from and there's an auto cut off when it reaches boiling point. With a fun 1950s-inspired design, this kettle is the perfect way to liven up your kitchen. Anti-slip feet can also be found at the base of each model, preventing the appliance from moving around. The handy push opening on the kettle lid makes refilling quick and simple. Power: 3000 W. Body material: Stainless steel. Auto shut-off at 100°C. Used, kettle powers up and boils water . The letters are 3D on the new KLF03 Models. 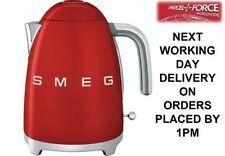 smeg kettle red. Condition is New. Original box opened once - Collection in person only. CORDLESS KETTLE. STAINLESS STEEL. Body material: Stainless steel. Water level indicator. NEW 3D LOGO. Soft opening lid. 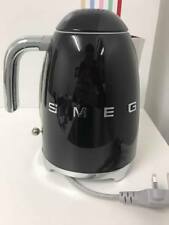 SMEG KLF01 50's Retro Style Kettle - Black. Condition is New. Dispatched with Royal Mail 2nd Class. Used, kettle is fully functional. The letter are 3D on the new KLF04 Models. 3kW of power provide quick and efficient operation, while the removable, washable stainless steel filter allows for easy cleaning after use. The kettle is complete with an auto shut-off feature, which turns it off when the water reaches 100 degrees, for added safety. This kettle has a dent in. Used, kettle powers up and boils water . The letters are 3D on the new KLF03 Models. Any and all claims of products being faulty because they may not work in your chosen country without checking will be denied. Anti-slip feet. Body: Stainless steel. Power: 3000 W. Frequency: 50/60 Hz. Product details. Any and all claims of products being faulty because they may not work in your chosen country without checking will be denied. Body: Stainless steel. Power: 3000 W. Frequency: 50/60 Hz. Stylish 50's style kettle beautifully crafted with a stainless steel body. Auto shut-off at 100°C. Power: 3000 W. Frequency: 50/60 Hz. Anti-slip feet. CORDLESS KETTLE. Body material: Stainless steel. Water level indicator. NEW 3D LOGO. Auto shut-off at 100°C. 360° swivel base. Soft opening lid. Power: 3000 W.
Water level indicator. Capacity: 1.7L. Non-slip feet make the toaster safe and stable on any kitchen surface and a removable crumb tray makes cleaning quick and simple. It features 2 extra wide slots with automatic centering racks to ensure your bread gets evenly browned on each side, and has 6 browning levels to choose from so you can make your toast exactly how you like it. Add some retro charm to your kitchen with a SMEG kettle, the perfect kitchen appliance for any tea lover. SMEG kitchen appliances are famous for their retro 1950s designs, mixing quirky looks with great performance. In this range, you'll find loads of tea kettles in different shades and styles, so you can pick out the perfect option for your kitchen. One of the things SMEG kettles are most known for is their iconic 1950s-style colours, and you can browse through a range of pretty pastel shades to pick the perfect colour for your kitchen. If you love all things girly, a cute pink SMEG kettle would be the perfect addition to your kitchen appliances. Or, you could pick up a pastel blue or green SMEG tea kettle. With polished stainless steel accents, they're a retro twist on a kitchen essential. For something a little bolder, you'll find bright red tea kettles that are ideal for injecting a shot of colour into your kitchen. There are also the classic monochrome colours such as black and white that will pair with almost any style of kitchen decor. For a really space-age look, go for an all-over stainless steel SMEG kettle with a high-shine finish for maximum impact. SMEG kettles are not just an attractive decoration for your kitchen, they're also efficient and powerful. With anti-slip feet and a concealed heating element, SMEG kettles are designed with safety in mind too, which is perfect if you have curious little ones at home. For something with added features, look out for a SMEG Variable Temperature Kettle. With seven different heat settings, from 50 degrees to 100 degrees, you can choose your ideal temperature. There is even a 'keep warm' function that prevents your water from cooling down too much before you use it, saving you lots of time.